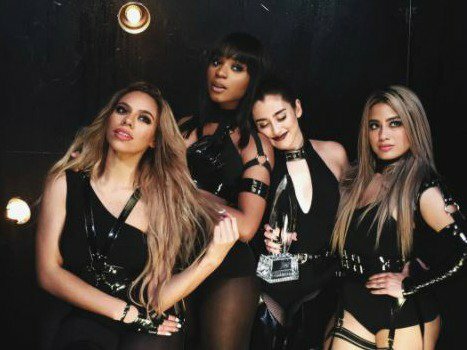 Fifth Harmony is set to release their first single since Camilla Cabello's departure. Fifth Harmony teased their first single without former group member Camilla Cabello. The group revealed on Tuesday that their new single, 'Down', will drop on Friday, June 2. Ally Brooke, Normani Kordei, Dinah Jane, and Lauren Jauregui all shared a picture of the single's cover art on their social media pages. It's the first time their fans will get to hear new music that does not feature Camilla, who was one of the group's lead vocalists. Camilla, who left the group in 2016, has already moved on. She released her her first solo single, 'I Have Questions', earlier this month. The track is off her upcoming album, 'The Hurting, The Healing. The Loving'. "It’s a story of my journey from darkness into light, from a time when I was lost, to a time when I found myself again... The story behind the album starts with the second song that you’ll hear called ‘I Have Questions,’ which I started writing in a hotel bathroom on tour a little over a year ago. I was completely broken during that time, I was in the kind of pain that’s uncomfortable to talk about, and it was the kind of chapter you never want to read out loud," Camilla said on Twitter. Our new single #DOWN ft. Gucci Mane @laflare1017 coming June Second.